Dubai is famous for its architectural wonders, and as much as we love admiring their beauty from up close, sometimes you can get the best views from places you’d least expect it. So whether you’re a photographer looking for new vantage points, or you’re just here to enjoy the view, here are a few spots in Dubai to get the best views of Dubai landmarks! We can’t think of an angle where the Burj Khalifa doesn’t look magnificent, but there are some places that trump the rest. Apart from the Dubai Fountain, some other great spots in Downtown Dubai to view the Burj Khalifa. Head to The Palace Downtown, the bridge from Dubai Mall that leads towards the Address Downtown, Neos at Address Downtown, Burj Park, the Burj Club pool deck, Above at Sofitel Downtown, and if you know anyone who lives there, Burj Views! If you’re planning to visit Madinat Jumeirah, Al Qasr or Jumeirah Beach Hotel, the view of the Burj Al Arab from any of these spots are insane! Some of our favourite viewpoints are from Pierchic, Shimmers, Summersalt and the Abra ride. However, if you’re looking for something a little different, head to Sunset Beach in Jumeirah for picture-perfect views. As stunning as the view from the Palm Jumeirah boardwalk is, one of the best places to admire the iconic Atlantis Hotel arch is from the water. Whether you’re planning a yacht party, or you’re taking a boat tour with Yellow Boats Dubai for example, just sit back and enjoy the view! 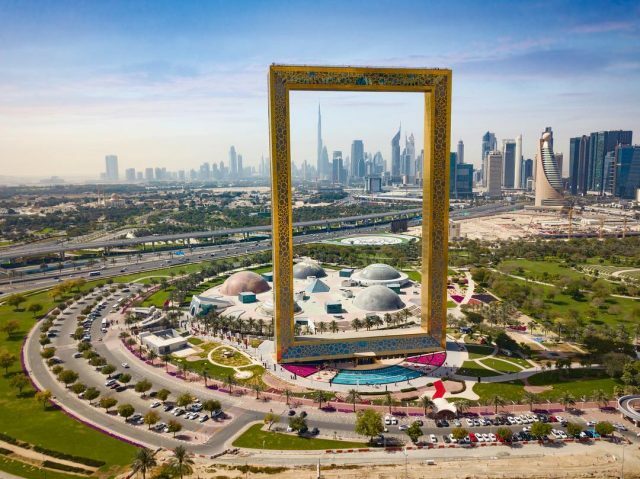 Looking for a picture-perfect view of the Dubai Frame? Karama is a great vantage point to visit, especially if you’re planning to recreate the iconic image of the Dubai skyline perfectly captured in the frame. However, our favourite place has got to be Zabeel Park. There are so many different angles to view the frame, and you can get super creative with your shots! There are sooo many great spots to view the Dubai skyline, and from different angles! For a full skyline view, you need to visit Dubai Creek Harbour! Alternatively, if you’re looking for something slightly different, the skyline views from Mercury Lounge, Gevora Hotel, Shangri-La Hotel and Level 43 at Fairmont Sheikh Zayed Road are incredible. Read more: Want to see how much Dubai has evolved? Check out these incredible before & after shots of Dubai..